Seem like a tasty notion. I like different flavored Oreos (mint, chocolate, peanut butter – they’re all great). Raspberry and chocolate together are kind of fantastic. 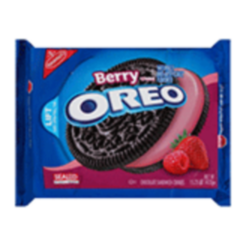 So a raspberry oreo seems like a winning combination, right? Nabisco disagrees. Instead, they figure a hypersweet powdery paste of Trix and Cap’n Crunch berries between Oreo wafers would be a better idea. It is not. Just so you know. This entry was posted in General and tagged Cap'n Crunch, cereal, cookies, food, haiku, junk food, Nabisco, oreos, poetry, raspberry, snacks, Trix. Bookmark the permalink. That’s why I was iffy about trying the berry–my mom bought the birthday cake flavor and it was not good. I do love the lemon though, they’ve become my new favorite cookie. Yes! The lemon ones are fantastic. Hard to find though. Hmm, I haven’t tried the lemon, but now I may just have to! Guess that explains the weird color on the package. I hear pumpkin spice is next up (white cookie). Not sure that’s a good idea either.